Os grid reference: TQ 3267 8090. Hidden-away in a recess at the front of what was the Bank of China on Canning Street, Camden, London, close to the Cannon Street Underground Station, is the so-called London Stone, a relic perhaps of Roman Londinium. Sometimes also called ‘the Brutus Stone’ or ‘Britto Stone’ after the Celtic leader of the same name who was hailed as king of what would become London, according to The Legend. It is actually a squat round-shaped stone that is now much diminished in size and which may, in fact, have been a 15th century boundary stone? The stone’s location is close to the corner of St Swithins Lane and nearly opposite Bush Lane. St Paul’s Cathedral is 1 mile to the west while the river Thames and London Bridge are about a quarter of a mile to the south of Canning Street. At the front of the W.H.Smith building at no.111 Canning Street in a specially designed stone recess stands the curious ‘London Stone’, a round-shaped stone that could be part of a Roman altar that was dedicated to the goddess, Diana, so says Geoffrey Ash in his great work ‘Mythology Of The British Isles’. It was apparently set-up by Brutus, grandson of Aeneas of Troy, a self-styled king of what would become “London”. Brutus is said to have had a palace on the site of the present Guildhall about 1 mile to the south-west, beside the river Thames. The stone is 1 foot 5 inches high by 1 foot 9 inches wide and is made of Limestone that was quarried in Rutland, though it has been suggested that it is Bath stone? It sits securely behind a decorative iron grill, fronted by a very nicely-carved outer recess made of Portland stone, at the top of which there is an information plaque; the inner recess is surrounded by thick glass for extra security. 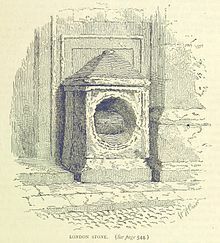 The stone originally stood at the north-side of Canning Street – where it was set into a niche in the south wall of St Swithin’s Church, close to the Mansion House, according to Janet & Colin Bord ‘Mysterious Britain’. St Swithin’s church was demolished after it suffered from being bombed during the 2nd World War; the stone was moved to the Guildhall museum, then eventually to its present site in Canning Street. 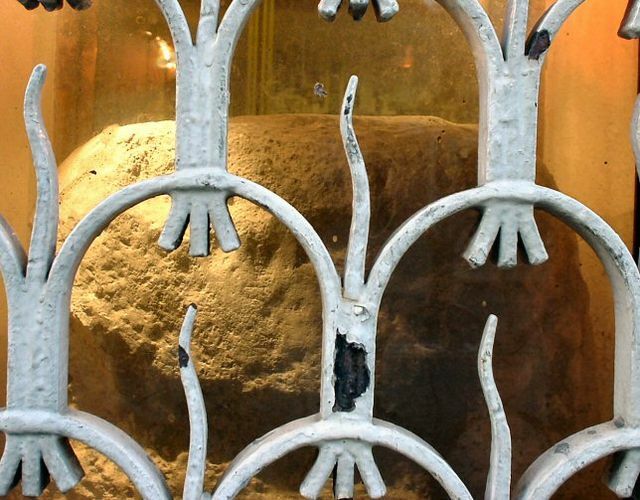 According to documentary evidence the stone was in existence in 1100 and 1188, and in the 16th century it was mentioned again by the antiquary John Stow, who was to describe it as: “a great stone called London Stone, fixed in the ground very deep, fastened with bars of iron, and otherwise so stronglie set that if carts do runne against it through negligense the wheeles be broken, and the stone itself unshaken”. In the work ‘Mysterious Britain’ the Bords say that: “Although there is no tradition of it being used as a stone of initiation, the London Stone is of great intiquity and was held in veneration by the citizens who would make binding pacts across it and issue proclamations from it”. It would appear, therefore, that over many hundreds of years folk, maybe travellers and pilgrims, have been chipping away and breaking pieces off the London Stone to take away as a relic in case it possessed some sort of magical healing power – it may well have done so – and if that be the case it would have originally been a much bigger block of stone, maybe even some sort of pagan altar in the time of the Romans, or maybe from ancient Britain, long before the Romans ever came to Britain but, Brutus who was a Celtic leader – had set his eyes on our shorline! If he did ever come to Britain and reside at London, then it would have been roughly 1100 BC? The author James MacKillop says in his ‘great tome’ ‘Dictionary Of Celtic Mythology’ says that Brutus was a progenitor of the British people. He was leader of the Trojans and had “dreams” of the Temple of Diana beyond the setting sun. After invading the island [Britain] he defeats the mythical giant Gogmagog and then establishes law upon the land named for him – Britain (Prydain). But actually Gogmagog was killed by being hurled over a cliff by another giant called Corineus of Cornwall who was a champion wrestler of great strength and valor – Reader’s Digest ‘Folklore Myths and Legends of Britain’. Very gruesome-looking stone effigies of Gogmagog and Corineus stand inside the Guildhall in King Street. Geoffrey of Monmouth mentions the legend of Brutus and the giants in his work ‘History of the Kings of Britain’ (1136). More likely than not London Stone was a ‘Milliarium’, a stone that was used to measure road distances in both Roman times, and long after that. And there is the famous saying: ‘So long as the Brutus Stone is safe, so long shall London flourish’. Ash, Geoffrey., Mythology Of The British Isles, Methuen, London, 1993. Bord, Janet & Colin., Mysterious Britain, Paladin (Granada Publishing), London, 1984. MacKillop, James., Dictionary Of Celtic Britain, Oxford University Press, Oxford, 1998. Reader’s Digest, Folklore Myths and Legends of Britain, ( Second Edition), Reader’s Digest Association Limited, London, 1977. Categories: Misc Subjects, Roman Sites, Standing Stone | Tags: London Stone at Camden in Greater London, London Stone on Canning Street in London | Permalink.